Product #18062 | SKU LP36126 | 0.0 (no ratings yet) Thanks for your rating! 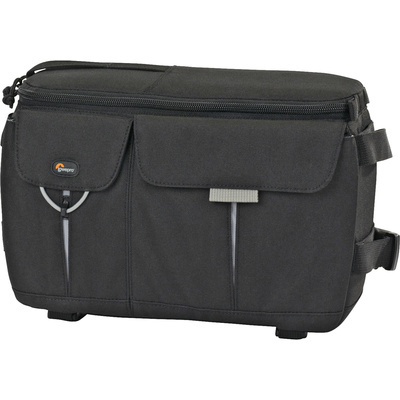 The Lowepro Photo Runner 100 Shoulder Bag (Black) is a fast-access, convertible beltpack/shoulder bag designed to carry a digital SLR camera with an attached standard zoom lens, plus one additional lens or flash (loaded vertically) or a digital SLR camera with attached zoom lens (up to 80-200mm f/2.8) (loaded horizontally), accessories and small personal items. It has a fast-access side lid used for working right out of the roomy main compartment. There are adjustable, padded dividers for customising the interior. There are 2 outside gusseted pockets that provide quick access to accessories and personal gear plus 2 memory card pockets on the inside lid. The tuck-away waistbelt with compression straps keeps the weight on the hips and helps minimise movement when worn as a beltpack. It can also be carried by a removable, adjustable shoulder strap with non-slip pad and a quick grab handle.